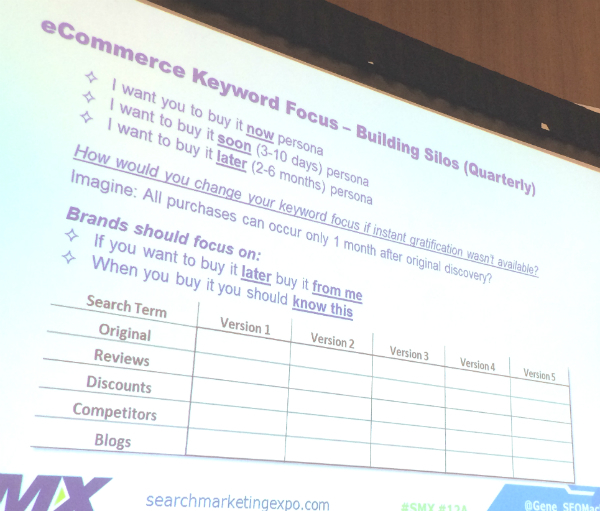 This report from SMX West 2015 takes place on Day 1 of the conference. Session moderator Matt McGee prefaces the presentations with a reminder that the poor keyword has been under attack with things like [not provided] and others. Later today, there will even be a session called “The Keyword Is Dead.” This session’s speakers would disagree with that. The presentations will highlight three parts of the research process for keywords. In Part 1, Mindy Weinstein, Bruce Clay, Inc.’s director of training, encourages marketers to start by taking a step back. Before you get deep into keyword research, understand your audience deeply. She shares questions to ask and tools to help you gain an intimate understanding of customers. 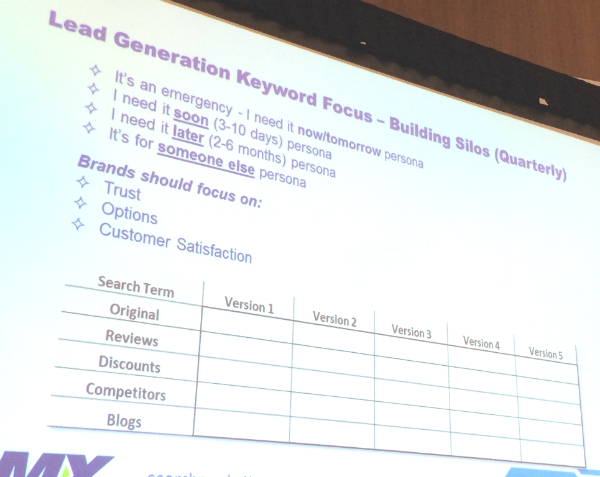 In Part 2, Gene Skazovski, senior director of demand generation at Tongal, outlines the characteristics of keywords for ecommerce businesses and lead generation businesses, explaining that the focus is different for each. In Part 3, Bill Hunt, president of Back Azimuth, shares detailed worksheets that marketers can fill out to identify the gaps of content to help a business more fully own their full buyer cycle. Today we’ll step back and look at the customer. Who are you trying to attract? This presentation is about becoming a mind reader. What should you do before using keyword research tools? If you understand who, then you’ll know their questions and needs, and you can craft compelling content for that. Get into the minds of your target audience. Searchers are advanced. It’s not keywords anymore, but whole sentences or questions. Customer service reps, receptionists and salespeople know the most about your audience base (aka customers). Get the firsthand account of how they describe their situation. 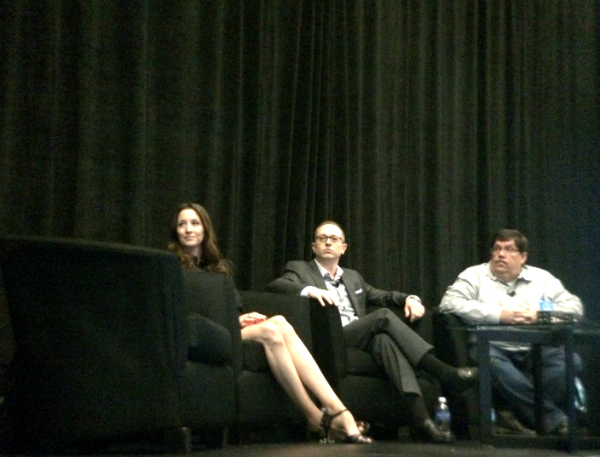 Dive into customers’ minds: questions asked, words used, demographics. She tells a story of a client who was a criminal defense law firm. The client wanted to target drug traffickers with their marketing. When Mindy’s team talked to the office receptionists, she discovered a couple important things about the audience. Most of the callers were calling and using words like “marijuana possession,” and most callers were women, the wives, girlfriends and mothers. Analyze the social interactions for your own brand and competitors’. Search social networks for words associated with your profession. Tool: Socialmention. Put in a word or brand associated with your product/service and see what people are saying about that and the words they’re using with it. Tool: Topsy. See language, links and influencers. Tool: Perchapp.com. 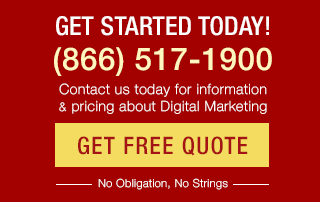 Get real-time info, look for keyword opportunities. Get involved in social listening. 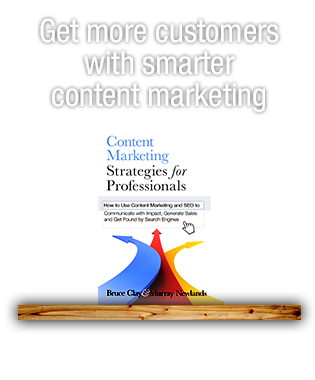 She recommends this article by Neil Patel for more info. Interview a sample of prospects and customers. They’ve converted. Why not find out from them how they found you and why they chose you? Use surveys, online contact forms and telephone prospect intake forms. Discover your prospects’ mindset at the time of their search and/or contact. Ask questions that uncover: their biggest challenges, what prompted the search, what sites they went to before yours, if they found the answer. Try the YouGov profiler https://yougov.co.uk/profiler#/. Enter a word or brand and see a profile of the typical audience member. SEOtools.com/ksp-tool gives you demographic info by keyword. 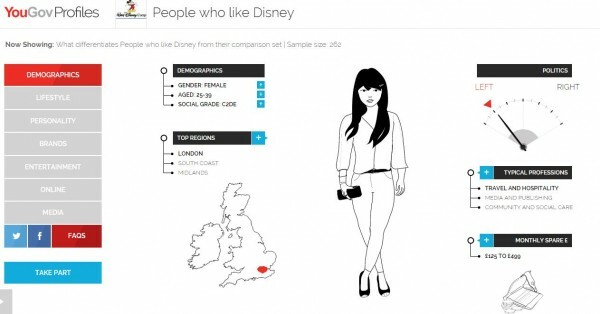 A YouGov profile generated for the Disney brand. Know them. Interact with them. They have to feel like you understand them. 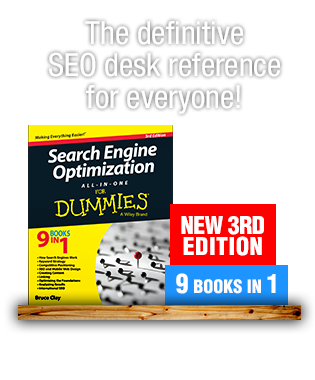 This is a step before the keyword research tool. It’s going to be a difference maker in connecting with the audience if you know them first. 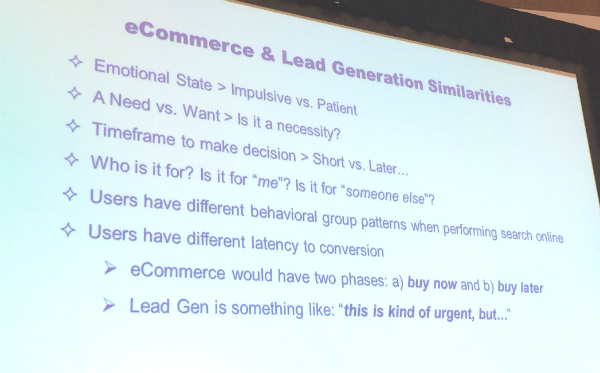 There are two different audience types: lead gen and ecommerce. They have a different focus and different keywords. Have you gone through the entire buying cycle of your business? Do you know how long it takes to go through the whole buying cycle? From the original query, do you know the distractions? What else are people looking at and going to from an initial query SERP? Many recommended keywords are displayed as related searches below the results on a SERP. Let’s buy a 70″ TV. A second query after “70 inch television” might be “best 70 inch television.” For the first query you see lots of ads (last-click conversion driven). With the refinement you get fewer ads and more research-servicing content. Other search options are specs, branded, coupons and savings. It helps to know about semantic search, which means Google is looking at searcher intent and contextual meaning and using synonyms and related terms. 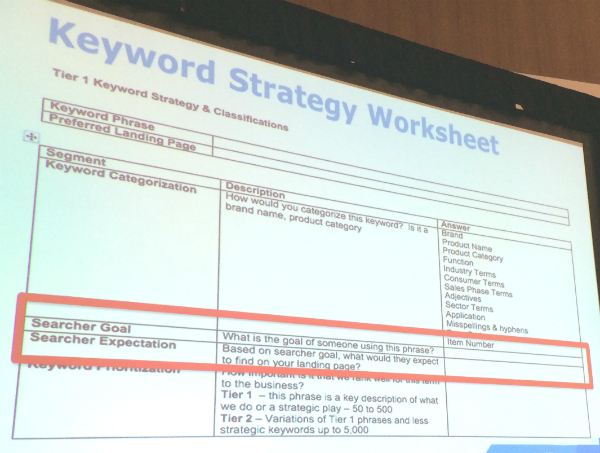 Use the worksheet on the bottom every few months and your keywords will be dialed in. Tip: Silo keywords based on customer funnel and intent, not single broad root variations. Let’s shift our thinking about search and keywords. Identify all products and product categories. 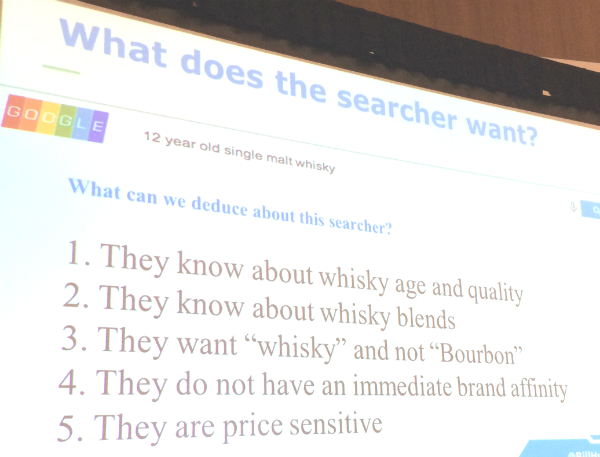 Understand the interest of the searcher. Map to the full buying cycle. Develop share of search model. In his experience, there’s not a single company out there today that owns the entire buy cycle. 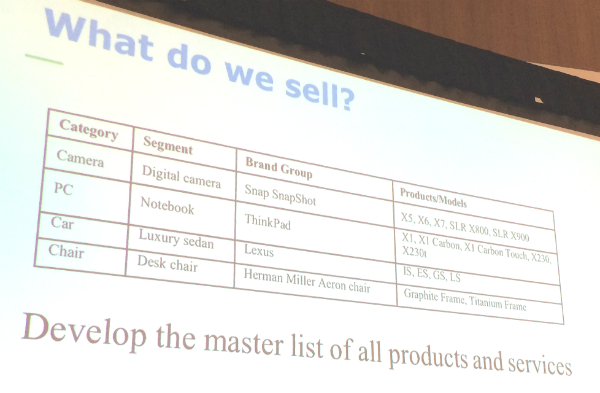 Ask: What do we sell? Start with a matrix. In this chart we’re looking at people who already know about you. Easy stuff. A simple chart like this can be stemmed. Keyword qualifiers are words that help us isolate a specific opportunity, interest, audience or need. 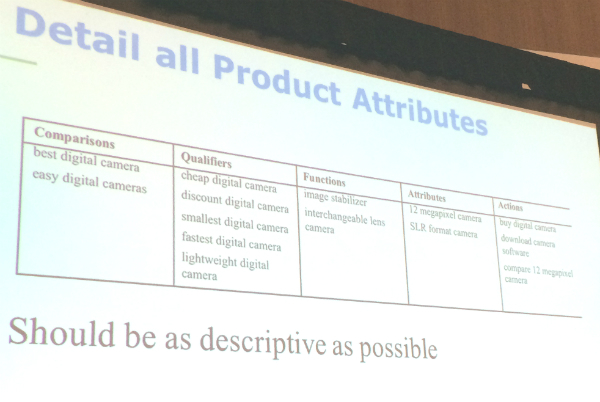 Detail all product attributes, making them as descriptive as possible. 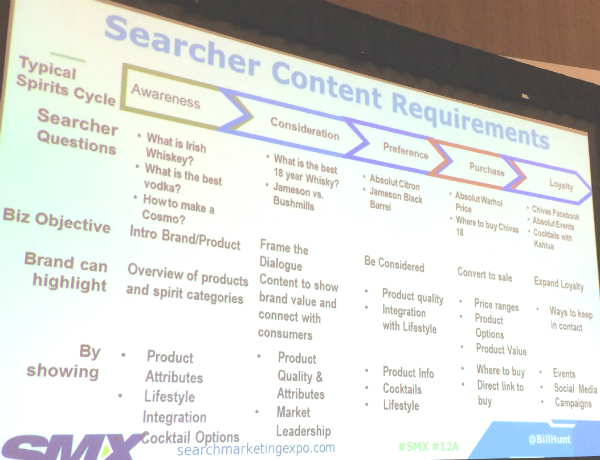 The searcher continuum is a series of queries that get closer to the purchase. You’ll see as you move down the continuum that the vision becomes clearer and more detailed. Focus on the money, the most valuable terms with high margin. Sort by margin and see where you make the most money. Fix that first. How would people look for this product if they wanted to buy it? When they use this phrase, what’s their objective? Based on the goal, what would they expect on that page? Based on the buy cycle, what is the expected next step for this searcher? This gives you the next pieces of content you need to build. Site search data gives you critical insight into your content gaps. Listen to what people are asking on the website. Include a link that lets the visitor do what they’re looking for.